Pump Accessories Protect your pump with low water pump cut-off switches and control the flow with variable speed controllers. 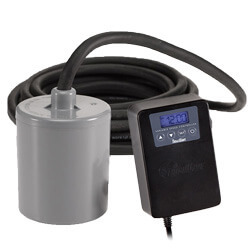 The Little Giant Pump Cut-Off Switch is perfect for mounting inside of your skimmer to protect your pump from running dry in a low water situation. Protect against plugging by creating a large surface area around the pump. Designed to fit all brands of small pumps. Has a polyester filter media pad inside of a nylon mesh bag. Drawstring top with push button release keep the top closed around the pump yet makes for easy pump removal. Prevents pump damage and flow reduction due to debris and clogs. Expandable units available in single or double Matala filter media core for superior biological filtration. Universal barbed fittings accept 1", 1-1/4”, 1-1/2" tubing or 1-1/2" MPT. The EZ Bio Filter can be used as a biomechanical pre-filter for circulation pumps, filtration pumps, and water fountain pumps. Improved pump efficiency: prevents premature clogging. Highly efficient filtration: progressive 2 stage filtration. Ez install: 1.5" connector plus flexible tube adapter. Ez clean: minimal maintenance, ez cleaning. Ez integration: can be extended with multiple sections.